Happy Monday, all!! Did you have a great weekend & Mother's day? I got to see my mom on Thursday when she stayed the night over here before catching a flight with her two sisters to surprise their mom for mother's day. How fun is that?! We went to dinner at The Mustard Seed, and it was fantastic. I had a gluten-free dessert inspired by the Somoa girl scout cookie...and it was SO good. So good. Makes me want to go & get another one like, right now. Ha! Josh got home from Minneapolis late on Friday night, so we slept in a bit. After getting up & going, we headed over to Helena so he could check out the Archie Bray Foundation...and it was pretty cool! They had a mother's day event going on, so besides just purchasing some clay he wanted...we were able to check out the festivities. It was fun! 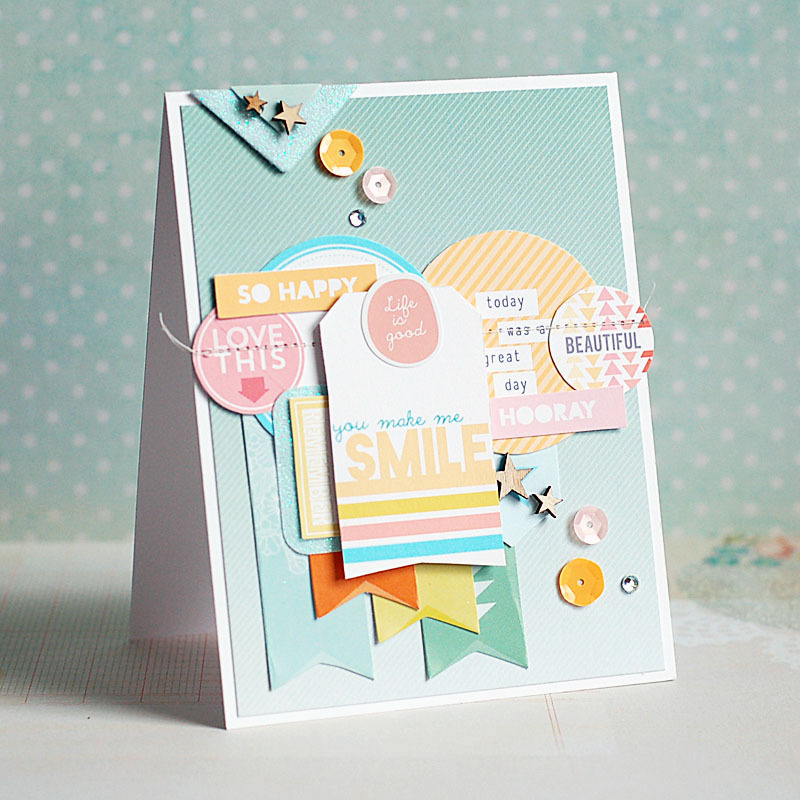 So, I created a happy little card today using a bunch of Studio Calico product, including the printables that they offer each month. When I purchase them, I print them out immediately so I don't forget that I have them! They absolutely complete all the different collections for me, and even better...they come in separate digital images as well, so I can use them on my digital layouts. :) Here is what I created! 2. Cut background paper slightly smaller. 3. Cluster the banners & circles to the card front, then stitch along the middle of the circles. 4. Clip the excess string, then adhere the entire block to the card front. 5. Adhere the tag to the front using foam adhesive, then accent the top of it with a sticker. 6. Add the other tabs & word art to the front. 7. Layer two triangles to the top of the card, then accent with stars, sequins & a jewel. 8. Add matching stars, sequins & jewel to the opposite corner to finish. Sigh- I love this card! So soft & fun, and I love the ombre shading on the background paper. 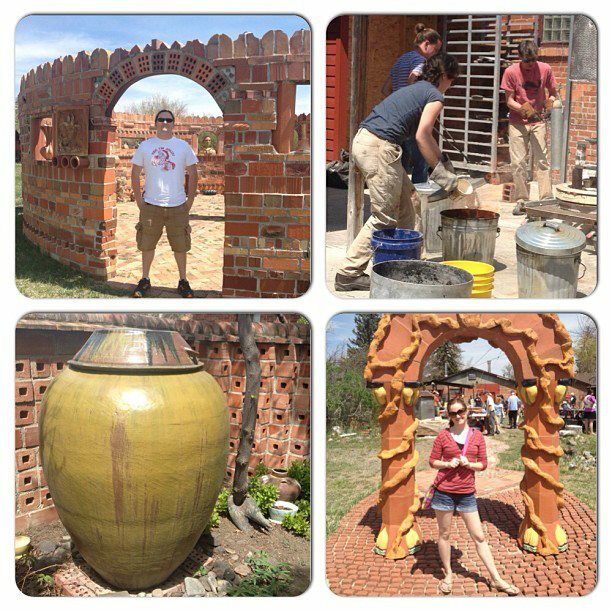 That is all I have to share today in terms of crafts....but here are some of my Instagram photos from this weekend! 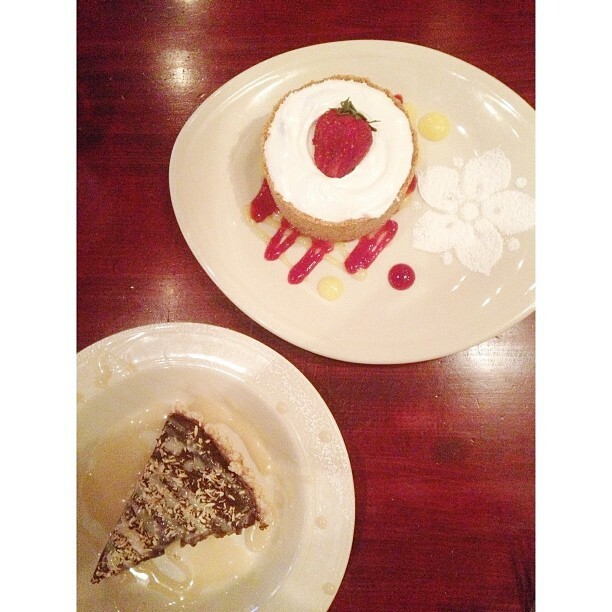 The top photo is the desserts that my mama & I had at our dinner together. 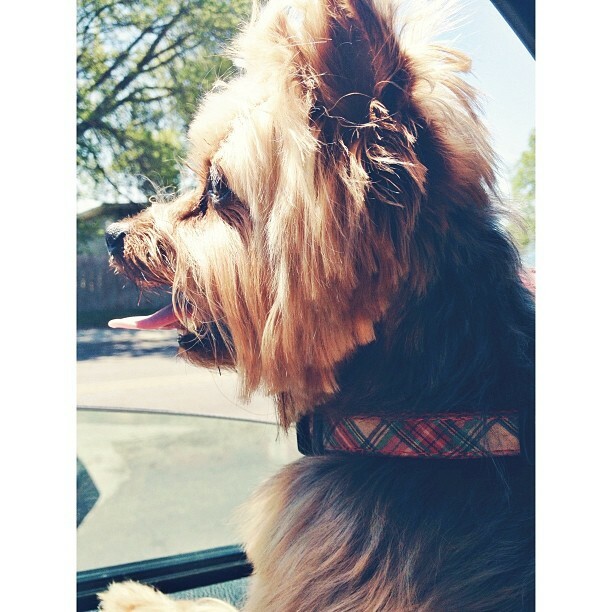 The next shot is my cute yorkie, Bailey, on the way home from the groomers. Best day ever for him...all nice & clean, and getting to hang his head out the window. And the last one is a little collage I made of our little trek over to the Archie Bray Foundation. I hope that you have a great rest of your Monday! GORGEOUS Card!! Loving all those great layers! Fun photo's too, glad you and your mama go to have dinner together! This is such a sweet card! And beautiful layering. Love the design of your card with the circles and pennants, great layers, and that dessert sounds fantastic!!! Your composition is always inspiring! Love the layering and details! Thanks for sharing the yummy photos! Such a beautiful card. All those elements have been put together to create a stunning card! I looooove Studio Calico products. Thanks for playing along with us at Cardabilities! Love your layered card. It's lovely. I really like the tag layered over all the little banners! Great colours too!